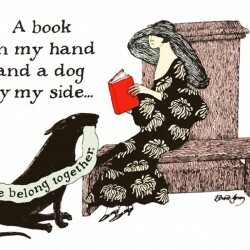 *Cross-posted on Wordpress and Goodreads. Disclaimer: I witnessed the production of this book from the sidelines. *Currently available from Lulu as a non-profit ebook or freely and legally download it HERE. This is a small collection of essays and reviews, some of which were deleted by Goodreads, on GR’s censorship policyimposed on September 20th, 2013. None of my articles, posted on my blog, were included as there were some legal issues over my screenshots, opinions and accusations e.g. calling them a ‘badly behaving social network’. Intelligent, witty, cheeky and bold, the various perspectives expound on the personal, literary, legal and technical implications of the opposed changes. They informed, analyzed and challenged GR’s decision to move towards censorship, and echoed my thoughts and feelings on the situation exactly. 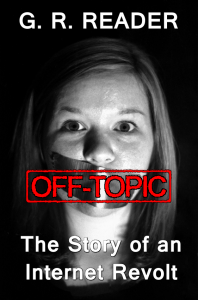 OFF-TOPIC possesses a very narrow and biased focus, concentrating exclusively on Goodreads and its reviewers, and for the most part excludes dissenting points of view and the wider context of author opinions on the new policy, Amazon’s censorship of self-published authors, and various retailers removing all ebooks by self-published authors while they weed out the excessively offensive and illegal works. These events were taking place concurrently during a 3-week period and one wonders if they’re all interrelated. Some contributors have authored several pieces within the book. They also happen to be the most popular reviewers on Goodreads, the most visible, so many will have previously read what’s included here. It would’ve been nice if OFF-TOPIC contained a few more pieces submitted from less high profile Goodreads members to showcase variety and prove that this policy has an impact on everyone rather than the most prolific or active minority. And while the majority of the pieces are thoughtful, well-written and entertaining, there is repetition and overlap in particular areas where my attention wandered. Considering the limited scope of subject area, this is to be expected. I’ve tried to review this work fairly, in light of my obviously biased standpoint, evaluating OFF-TOPIC as I would any other non-fiction read.